Come see just how fun and easy camping can be with this Cardinal Explorer 392RD in tow! For the kitchen amenities you will find an island with a double sink, and you can store your food at the large pantry. When you want to relax and visit with your family then come do so in this spacious rear living area. Here you will find dual opposing slide outs with two sofas plus theater seating along the interior wall. You can enjoy watching TV at the entertainment center. When you are ready for a great night's sleep, then come retreat to the front bedroom where you will find a king bed. There is plenty of storage in this room with the dresser and the wardrobe. In the evening plan to enjoy your time outside under the 16' electric awning with LED lights. 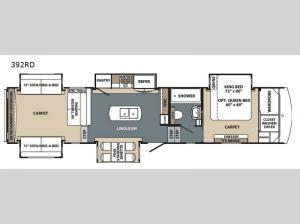 When you choose to camp with a Forest River Cardinal Explorer, you are choosing a quality built fifth wheel with plenty of features throughout. You will enjoy how functional the kitchen is with the Furrion 2-in-1 21" oven/range with LED knob indicators and Magic Chef 30" residential microwave. Crown molding is featured throughout each unit which creates a high-end residential look, and you will appreciate the Shaw brand carpeting and linoleum which is backed by a 7-year cold crack warranty. Each Cardinal Explorer is constructed of an all welded aluminum frames, Alpha Superflex TPO membrane roofing, a high gloss gel coated fiberglass exteriors, and MORryde CRE 3,000 suspensions for a smooth towing experience. It also features a 100" wide body frame which allows for plenty of space throughout.